Beijerinck studied the tobacco mosaic virus. which helped Jonas Salk create a vaccine for the poliovirus. because they do not have cells or their own metabolism. we talk of killing viruses. whose killer cells use enzymes to disassemble viruses. Louis Pasteur suggested that the cause of rabies was a pathegen smaller than a bacterium. Normal microscopes can not see things that were as small as viruses. Wendell Stanley showed that viruses were particulate. Eventually, electron microscopes showed what they look like. Others isolated them with ceramic filters, crystalized them, and examined these with X-rays. We know now that a virus is a non-cellular structure with a core of DNA or RNA protected by a protein shell. Of the millions of different animal, plant, fungal, and bacterial viruses, only about five thousand have been described. 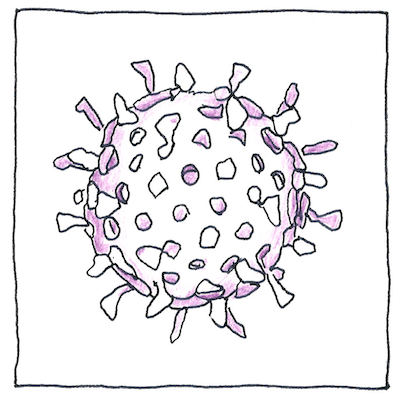 A teaspoon of seawater contains about one million viruses (most harmless to plans and animals).